This is such a beautiful light. We received many compliments about it. It’s unique and elegant. I really recomant it. Dimensions 23.75 In. X 23.75 In. X 72.0 In. This light is perfect for our minimal design! The LED bulb makes it super bright and lights up our whole downstairs. It is the perfect size to make a statement but not detract from the design we have on our table. 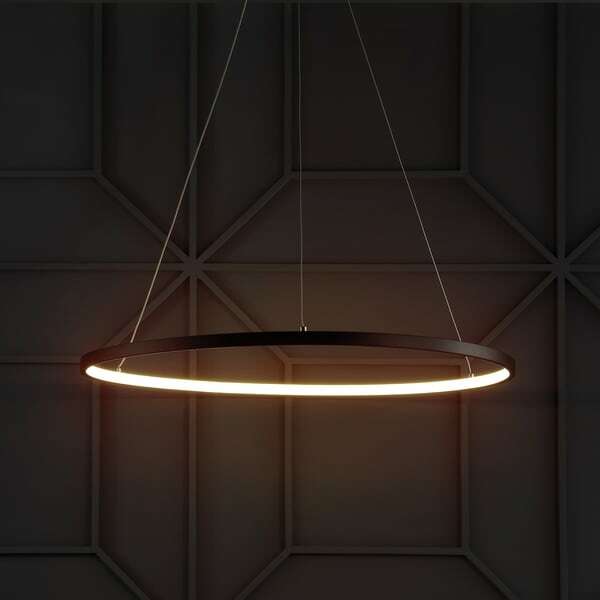 This light is elegant, simple and interesting. Everyone that sees it comments on it. We placed it in our mudroom and it immediately became my favorite light in the house. "Is this a dimmable LED fixture?" Unfortunately it's not dimmable at the moment. "How many lumens will 34 watts give out? Also, how long will the LED light last? Is there a warranty on the bulb?" "34 Watts is how bright it can get? Bummer"
A 12 watt LED is equivalent to a 60 watt incandescent; each produces 800 lumens of light. Wattage measures the amount of energy used; brightness is measured in lumens. So at 34 watts, this fixture would be equivalent to three 60-watt incandescents. I was thinking of buying it, but since it's not dimmable (and based on the comments about how well it illuminates), I'm afraid it would be too much over my dining tableâI would want less light at times. Love the fixture, though, and would buy it right now if it were dimmable.